Communist dictator Kim Jong-un agreed to hand over the remains of an unknown number of American soldiers killed during the active period of the Korean War (1950-1953) during his June summit with U.S. President Donald Trump. While President Trump claimed in a recent speech that Pyongyang had begun the process to return the remains, State Department officials say they have not yet received any, and anonymously confirmed Thursday that North Korean officials simply did not show at a meeting to discuss the transaction. The Washington Post cites a “U.S. 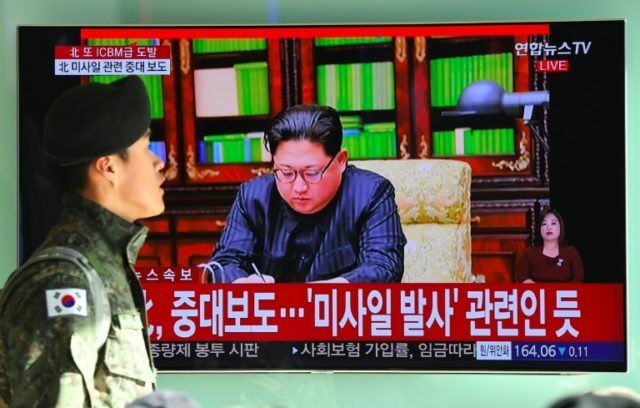 official with knowledge of the situation” who told the newspaper that the U.S. negotiating team was ready at the border between the two Koreas on Thursday, but “it just didn’t happen. They didn’t show.” The newspaper identifies the negotiators waiting for the North Koreans as “Department of Defense and United Nations Command” officials. While the State Department did not respond to requests for comment from the Washington Post, Secretary of State Mike Pompeo had said last week that the two sides had scheduled talks on the remains for June 12, but “it could move by one day or two.” There is no evidence, however, that the Americans were aware of any date or time change. Several South Korean outlets also confirmed the news, citing officials in and around Panmunjom, the “peace village” in the DMZ typically used for such meetings. The South Korean outlet Yonhap reported Thursday, also citing unnamed sources, that North Korea is now demanding “general-level military talks with the United Nations Command (UNC) over the repatriation of remains of American troops” to the UN directly. The news agency noted that the request followed North Koreans not showing up to the meeting with U.S. representatives. “With the meeting not taking place, the UNC reportedly made a phone call and North Koreans responded by saying that they needed to upgrade the ‘level’ of the talks,” Yonhap claims. The discussions have tentatively resulted in a scheduled discussion for Sunday. North Korea’s failure to show up to the meeting follows a tempestuous week in the ongoing denuclearization talks with Washington. Pompeo made his first overnight visit to Pyongyang last week to discuss a specific definition for denuclearization of the Korean Peninsula, which for America would require the complete elimination of the North Korean nuclear program. Following his departure from the country, a spokesman for North Korea’s Foreign Ministry alleged that Pompeo had made “gangster-like” demands on the country by asserting that nothing less than complete, irreversible, and verifiable denuclearization (CVID) would do, a demand that Pompeo has consistently made for months. “If those requests were ‘gangster-like’ then the world is a gangster, because there was a unanimous decision at the U.N. Security Council about what needs to be achieved,” Pompeo replied. The Singapore Declaration – the document President Trump signed jointly with Kim following their meeting in the country – reads in part, “the United States and the DPRK commit to recovering POW/MIA remains, including the immediate repatriation of those already identified.” As the war was fought on Korean soil, however, only North Korea has remains to return. On June 23, the Pentagon confirmed that it had moved 100 wooden coffins to the DMZ to receive the remains that North Korea promised to return and would soon move another 158 metal transfer cases to the border. Reports at press time indicate that those coffins remain on the border but have not been filled with the promised remains. The Pentagon confirmed this following President Trump’s declaration at a speech that week that “we got back our great fallen heroes, the remains sent back today, already 200 got sent back.” The Pentagon did not confirm this claim. Through decades of negotiations, North Korea has repatriated 629 sets of remains of American soldiers to the United States.